• The dopamine hypothesis of schizophrenia claims that increased dopamine activity underlies psychotic behavior. This hypothesis gets major support from the reported d-amphetamine-induced worsening of psychosis, because amphetamine increases dopamine activity in the brain. Dopamine receptor supersensitivity has been shown to be present in animals during the postneuroleptic period. In this study the postulated relationships between psychotic decompensation as observed after d-amphetamine infusion and the dopamine receptor supersensitivity expected to be present during the neuroleptic withdrawal period were examined. Twenty milligrams of d-amphetamine administered intravenously did not cause a stronger psychotogenic effect in 12 schizophrenic patients. 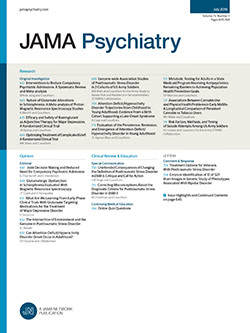 One week after discontinuation of pimozide treatment, the d-amphetamine-induced change as indicated by the Brief Psychiatric Rating Scale (BPRS) paranoid disturbance cluster score, was not significantly different from the response to a similar infusion during the drug-free state. Unexpectedly, the increase in the BPRS mannerisms and posturing item and in the pulse rate response to d-amphetamine were decreased. These results raise questions about the role of dopamine in d-amphetamine effects and suggest postneuroleptic dopamine receptor subsensitivity. They challenge a simple dopamine hypothesis of schizophrenia.